I just started experimenting with chia seed flour in my baking. I love the nutritional stats for chia seeds and want to incorporate them more into my baked goods. I found a great gluten-free blend that contains ground chia seeds, rose tapioca, millet and chestnut flour. It’s delicious in quick breads and muffins. I also use Pamela’s gluten-free baking mix and an unflavored protein powder called Whole Nectar in this gluten free zucchini bread recipe. You can leave the protein powder out and just use the chia flour and baking mix for this bread, but I love adding a little more protein in my recipes. This zucchini bread turns out very moist. I don’t even miss the wheat flours or refined sugar in the classic recipe. This gluten free zucchini bread is incredibly moist, and so healthy, with an added boost of protein powder and extra fiber from chia seed flour. Combine coconut sugar, agave nectar (or honey or maple syrup-your preference), applesauce, coconut oil (make sure it's room temperature), lemon juice and eggs. Mix thoroughly. In a separate bowl, combine flours, protein powder, cinnamon and nutmeg. Add dry ingredients to wet mixture and blend until mixed. Fold in zucchini and nuts. Divide mixture into four greased mini loaf pans and bake for 35-40 minutes, or two regular loaf pans for 55 minutes or until baked through. Looks really nice. Thanks for sharing. 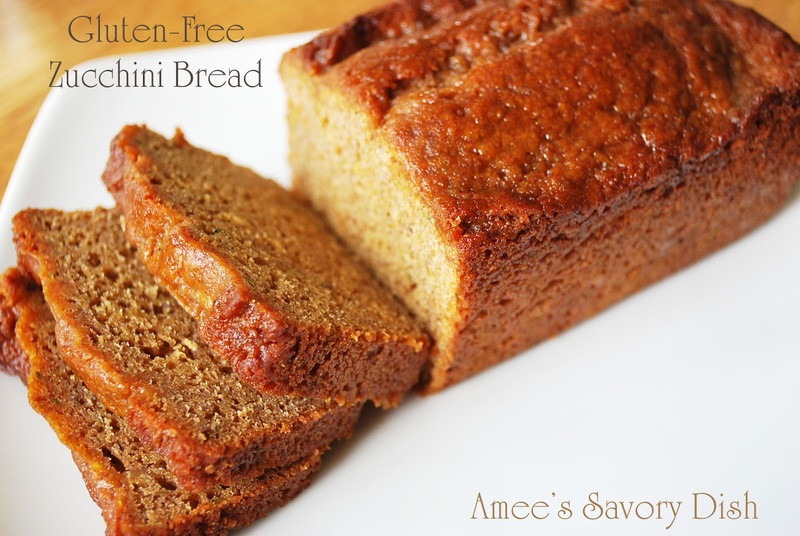 Mmmmmm…..I love zucchini bread and this one looks incredible – what a list of ingredients!! I’ve never seen omega flour here in Canada…wonder if it’s available, it looks awesome 🙂 Great recipe Amee! this looks absolutely amazing. Thanks for sharing on Foodie Friends Friday. Remember to come back and vote on Sunday! Thanks for sharing on Foodie Friends Friday. I hope you come back next week with another great recipe. I LOVE this Amee! I really need to start making more gluten free recipes in our house. I honestly think it will be beneficial in many ways. Definitely going to look for the items in your recipe. Thank you so much for sharing on Thursday’s Treasures week 46. <3 and hugs! I’ve featured this amazing bread on Thursday’s Treasures Week 47. <3 and hugs sweetness!